Edition 28 December 2018, by the President of the Republic of Kazakhstan, Mr. Nursultan Nazarbayev events. Space is the measure of all things, time is the measure of all events.When the horizons of space and time merge, national history begins. And this is not just a beautiful aphorism. The history of Kazakhstan should also be understood from the height of modern science, and not by its separate fragments. In addition, it is fundamentally important to note that we are talking about the history of Kazakhstan, which is common to many ethnic groups living on our territory for a long time. This is our common history, the contribution to which was made by many prominent figures of different ethnicity. The purpose is not to show one’s greatness by belittling the role of other nations. The aim is to calmly and objectively understand our role in global history, based on strict scientific facts. So, here are the seven facets of the Great Steppe. 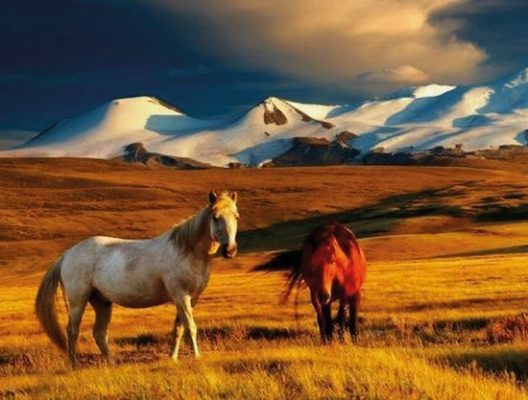 Everyone knows that the Great Steppe gave the world horse breeding and the culture of horsemanship. For the first time, the domestication of horses by a human took place on the territory of modern Kazakhstan, as evidenced by excavations of the Botai settlement in the north of the country. The domestication of the horse gave our ancestors an unthinkable superiority at that time, and on the global scale made the biggest revolution in the economy and military affairs. However, the domestication of the horse marked the beginning of a culture of horsemanship. A rider on a horse, armed with a bow, lance or saber, became a symbol of the era when powerful empires created by nomadic peoples came to the forefront of history. The image of the equestrian standard-bearer is the most recognizable emblem of the heroic era and a special “cultural code” of the nomadic world, the formation of which is associated with the birth of horsemanship. The power of car engines is still measured in horsepower. And this long-standing tradition is a symbolic tribute to that great era when the horseman dominated the planet. We should not forget that humankind enjoyed the fruits of this great technological revolution right up to the XIX century, which came into the world from the ancient Kazakh land. The basic components of modern clothing go back to the ancient era of the steppe civilisation. The culture of horsemanship gave rise to optimal clothing for the rider-warrior. Striving for convenience and practicality during riding, our ancestors for the first time divided clothing into upper and lower parts. Therefore they invented the first types of trousers. This gave riders the freedom to ride and battle. Those that lived in the steppe sewed trousers from leather, felt, hemp, wool and flax. Over the past thousand years, this type of clothing has not changed fundamentally. Ancient trousers found during excavations have the same shape as modern ones. It is also known that today all the varieties of boots are the “successors” of soft shoes with a shaft and heel, which nomads used for riding. In an effort to improve the control of the horse while riding, the people of the steppe invented the high saddle and stirrups. Innovations allowed the rider to sit confidently on a horse and, even when moving quickly, to more efficiently use his weapon – a bow, a spear, a sword. Our ancestors brought to perfection archery at a gallop – it changed the design of the weapon: it became composite, more comfortable to use and more deadly, and the arrows got plumage and a metal tip, piercing armor. 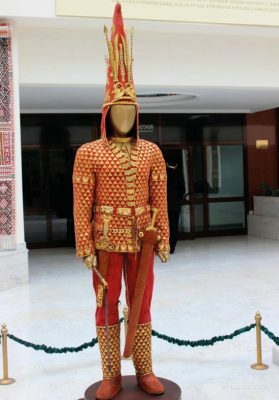 Another technological innovation introduced by the Turkic tribes that inhabited the territory of Kazakhstan was the invention of a saber, the distinctive feature of which was a straight or curved blade with a handle turned in the direction of the blade. These weapons became the most important and common in the arsenal of offensive weapons. Our ancestors were the first to create protective armor for the horse and the rider from armour plates. This led to the appearance of a heavily armed cavalry – the most important military innovation of the Eurasian nomads. Its evolution in the period from I millennium BC until the first century influenced the creation of a special kind of troops – heavy cavalry, which for a long time ensured an unprecedented military superiority of the steppe men, up to the invention and mass use of firearms. The invention of methods for producing metals opened a new historical era and forever changed the course of human development. The Kazakh land, rich in diverse metal ores, also became one of the first centers of establishment of metallurgy. The centers of mining production and smelting of bronze, copper, lead, iron, silver and gold, and the manufacture of sheet iron arose in the ancient antiquity on the lands of Central, Northern and Eastern Kazakhstan. Our ancestors constantly developed the production of new, more durable metals, which opened up opportunities for them to accelerate technological progress. This is evidenced by the furnaces found during the excavations, which were used to smelt metal, decorations, household items and weapons of earlier eras. This indicates a high technological development of the steppe civilizations that existed on our land in ancient times. Our ancestors lived in complete harmony with the outside world and considered themselves an inseparable part of nature. This key principle of being formed the worldview and values of the peoples of the Great Steppe. The ancient inhabitants of Kazakhstan had a highly developed culture – they had their own writing and mythology. The most striking element of their heritage, a reflection of the artistic originality and richness of spiritual content is the “art of animal style.” The use of images of animals in everyday life was a symbol of the interrelation of man and nature, pointing to the spiritual guides of the steppe people. They preferred images of predators, mostly felines. It is most likely not by chance that the snow leopard, a rare and noble representative of the local fauna, has become one of the symbols of sovereign Kazakhstan. At the same time, the animal style reflects the highest production skills of our ancestors – artistic carvings and the technique of working with metals are well known: the smelting and casting of copper and bronze, the methods for the complex manufacture of gold sheets. In general, the phenomenon of “animal style” is one of the highest peaks in world art. A sensational discovery for world science, which made it possible to take a fresh look at our origins, was the Golden Man, found in Kazakhstan in 1969 in Issyk, referred to in the circles of art scholars as “Kazakhstan’s Tutankhamun”. The warrior told us a lot. Our ancestors created the highest-level artistic creations that still amaze the imagination. Skillful golden guise of a warrior indicates confident mastery of the ancient masters of gold processing techniques. It also revealed a rich mythology, reflecting power and aesthetics of the Steppe civilization. So the steppe men exalted the personality of the leader, elevated him to the rank of a sun-like deity. The luxurious decoration of the burial introduced us to the intellectual traditions of the ancestors. On one of the silver cups found near the warrior, scribbled marks were found – traces of the oldest writing ever found in Central Asia. Altai is of great importance for the history of the Kazakhs and other peoples of Eurasia. From time immemorial, these majestic mountains not only decorated the lands of Kazakhstan, but were also the cradle of the Turkic peoples. It was here, in the middle of the 1st millennium, where the Turkic world was born, and a new milestone was reached in the Great Steppe. History and geography formed a special model of continuity of the Turkic states, the great steppe empires. For centuries, they have successively replaced each other, leaving their significant mark in the economic, political and cultural landscape of medieval Kazakhstan. Having mastered the space within wide geographical boundaries, the Turkic peoples managed to create a symbiosis of nomadic and settled civilizations, which led to the flourishing of medieval cities, which became centres of art, science and world trade. For example, medieval Otyrar gave humanity one of the greatest minds of world civilization, Abu Nasr al-Farabi, while in Turkestan, Khoja Ahmet Yassawi, one of the great spiritual leaders of the Turkic peoples, lived and worked. 6. The Great Silk Road The unique geographical location of Kazakhstan – in the very centre of the Eurasian continent – has contributed to the emergence of transit “corridors” between different countries and civilizations since ancient times. Starting from the turn of our era, these land routes were transformed into the Great Silk Road system – a transcontinental network of trade and cultural ties between East and West, North and South of Greater Eurasia. It has become a stable platform for the formation and development of the global interchange of goods and intellectual cooperation between nations. The key intermediaries of the most important trade route of antiquity and the Middle Ages, ensuring the flawless organisation and safety of transport arteries, were the inhabitants of the Great Steppe. 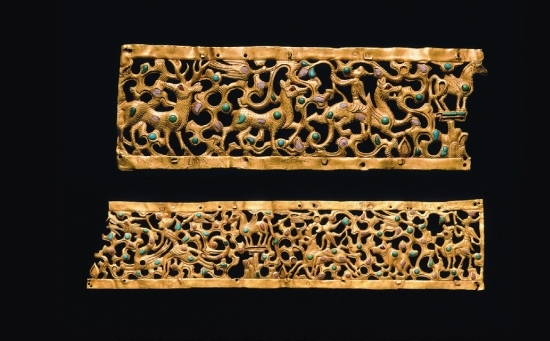 The steppe belt connected the Chinese, Indian, Persian, Mediterranean, Middle Eastern and Slavic civilizations. Since its inception, the Great Silk Road map has largely been located within the Turkic empires. It was during the rule of the Turkic peoples in Central Eurasia that the Great Silk Road reached its peak and promoted economic prosperity and cultural growth on an international scale. It is scientifically proven that the foothills of the Alatau are the “historic homeland” of apples and tulips. It is from here that these modest, but significant for the whole world plants gradually spread to all countries. And now Kazakhstan is the keeper of the progenitor of all the Earth’s apple trees — the Sievers apple tree. It was this tree that gave the world one of the most common fruits of our time. The apples that we know are the genetic varieties of the fruits of our apple tree species. On the ancient routes of the Silk Road from the foothills of the Trans-Ili Alatau on the territory of Kazakhstan, it ended up in the Mediterranean and then spread throughout the world. And as a symbol of this long history of the popular fruit, one of the most beautiful cities in the south of our country is called “Almaty”. Actually, here, in the Chu-Ili Mountains, we still see in its primal form pearls of Kazakhstan’s flora – the Regel tulips. These beautiful plants appeared on our land in the strip of deserts and foothills of the Tien Shan. From the Kazakh land, these modest but unusual flowers gradually spread around the world, conquering the hearts of many peoples with their beauty. Today there are more than 3 thousand varieties of cultivated tulips in the world, and most of them are “descendants” of our local flowers. In Kazakhstan, there are 35 types of tulips.